At the beginning of this year I started having a deep desire to go somewhere. I emailed and talk to many mission agencies. I even thought about going to Kenya, but that did not work out. One day I was on Facebook (FB) and a friend had posted about a fundraiser she was doing to go to Brazil. I quickly slid into her a direct message (DM) and asked her if it was possible for me to go with her. I was super interested in going to this trip because my sweet husband was born in Brazil. I knew that he would love to go back and see the country he was born into. Long story short, I talked to the mission leader and she said my husband and I could come. In every mission trip I have been too, I have fund-raised for it. I believe that in different seasons the Lord sends people but at the same time enables others to give for the sending. Raising money for this mission trip was no different than the others before this. Between Nathan and I we needed $2600 to go to Brazil for two weeks which included airfare, food, lodging and insurance in case anyone got sick. Two weeks before it was time to leave we still needed $1000 and I was freaking out a little bit. But we continued to trust that the Lord will provide. He did just that, He didn’t just provide, He abundantly provided and I was not surprised. We went to Brazil fully funded and we were excited to see all that the Lord had in store for us. Being married and going to a mission trip for the first time was challenging. Even though we were together the whole time, there were times where we struggled because we wanted time alone to just talk and flirt and stuff. I was personally not prepared for this part. My sweet Nathan got sick from drinking unfiltered water and had really bad diarrhea which i was not prepared for. It was hard to see him sick. The Town we were serving in was called Campos Frios and it held some of the sweetest human beings on this planet. In this little town I met people who helped me be more passionate, more loving to others and to myself, and to always treat people with the Love of Christ no matter what language we speak. I learned in this town that the Lord had blessed me so much with resources and that I get the privilege of blessing others. In this town I learned that I do not need a whole lot to be a whole lot. He was also my favorite, along with his favorite sign of saying hello to me. He was just the cutest and the way he said his name was the best. This is a picture of a cute little man who wanted to go to the bathroom and he was mad at me for not letting him because he had to wait in line. to distract him, i asked if i can take a picture of him and this was his best smile. He quickly became my favorite little guy and i just loved tickling him. Kid #1) I connected really well with him, especially with his favorite sign of saying hello to me. Kid #2) He was the cutest and the way he said his name was the cutest. Kid #3) He was the cutest little man who wanted to go to the bathroom and he was mad at me for not letting him go right away because he had to wait in line. To distract him, I asked if I can take a picture of him and this was his best smile. He quickly became my little friend and I loved tickling him. The Last day we did Olympics and it was amazing. Olympics is where all the kids just play sports and just run around acting crazy. Above is a two videos of the sports we played and they had the most fun. The last picture is when i gave kids some snacks and just enjoyed seeing them one last time before we had to go. What a crazy week it was! Before we did Olympics, we did little care packages for these sweet kids. We gave them like crayons, toothbrush, toothpaste, coloring books, pencils, etc. The kids were so excited about them. I was so glad they liked them and were excited to use them. God is so good. The team finished the church in 10 DAYS!!!!! How insane!! 2 weeks in Brazil, this is what happened : Over half of the women and men that came to get glasses accepted Christ into there heart. 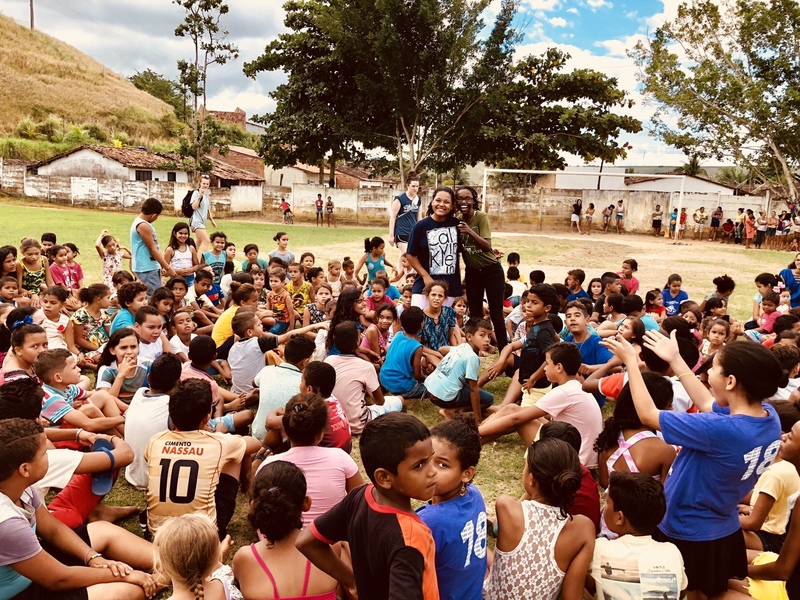 More than 75% of the kids in the ESL class accepted Christ into their heart, and SO many kids got to hear about Jesus and all that he did and does for them daily. We got to grow close with the people at the church that helped us out, and with each other!! It definitely wasn’t easy but God always equips us with the ability to do the easy and not easy. Thank you to everyone who made it possible for me and Nathan to go to this trip. Know that many lives were changed, and many seeds were planted. Lets continue to make him known throughout the earth. Lastly, enjoy this video of our guide Charlotte playing and sing in the street with some of the locals. She was one of the most welcoming person i have ever met. Brazil will have never happened if it wasn’t for this lady giving us so much direction in getting everything together. Obrigado por tudo, foi incrível a experiência de ter conhecido vocês, que Deus continue abençoando cada um de vocês!